While most of the Eastern States of Australia have endured their first cold spell of the year, the weather is still fine out west – seemingly so fine that there’s a rush to install café blinds! 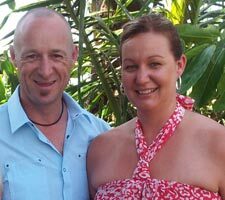 Vanessa and Ben from Outside Concepts Busselton Branch in Western Australia have reported they’ve booked five projects in four days, all involving the fitting of café blinds. A variety of Busselton outdoor blind styles have been ordered, including Ziptrack, café style and infill panels. Obviously there’s a lot of optimism about the weather in Busselton! The last of the five projects also involves the design and installation of an aluminium patio, to partly cover an in-ground swimming pool. Let’s hope for these homeowners’ sake that the fine weather does continue. So if you live in the Busselton area and want to get more use out of your entertainment area, phone Outside Concepts on 1800 601 674 for a free quote. But be quick – Vanessa and Ben’s time is filling up fast! Vanessa and Ben from the Busselton branch of Outside Concepts.